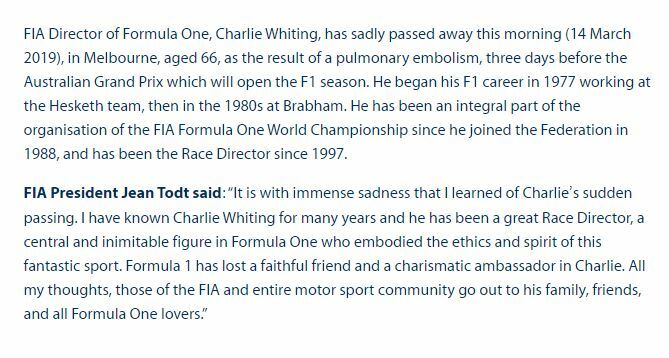 Charlie Whiting died last night of a pulmonary embolism. He was 66 years old. R.I.P charlie. F1's really gonna miss you. Unbelievable life is so precious you just do not know what is around the corner RIP CHARLIE the gloss has certainly come of the opening race in Melbourne but I guess CHARLIE certainly would want the show to go on flat strap. RIP Charlie! A sad sad day for the whole Formula 1 family. Sad day for Formula 1, The sport is in a far better place having had him involved in it. RIP Charlie. Just got to work and noticed that Charlie is gone :O And to think, that my dad and granpa had the same condition and survived, makes me realize once again, how fragile life is. RIP. R.I.P. Charlie. We will miss you. It was a huge shock when I read it. On the eve of the first race. Huge shock this morning, rest in peace Charlie, the drivers won't be able to reach you on the radio any more and you will be really missed. Thoughts with his family and friends. A sad start to the new season and he will be missed in so many ways, race starts will never be the same and he leaves a huge legacy within motorsport. RIP Charlie. 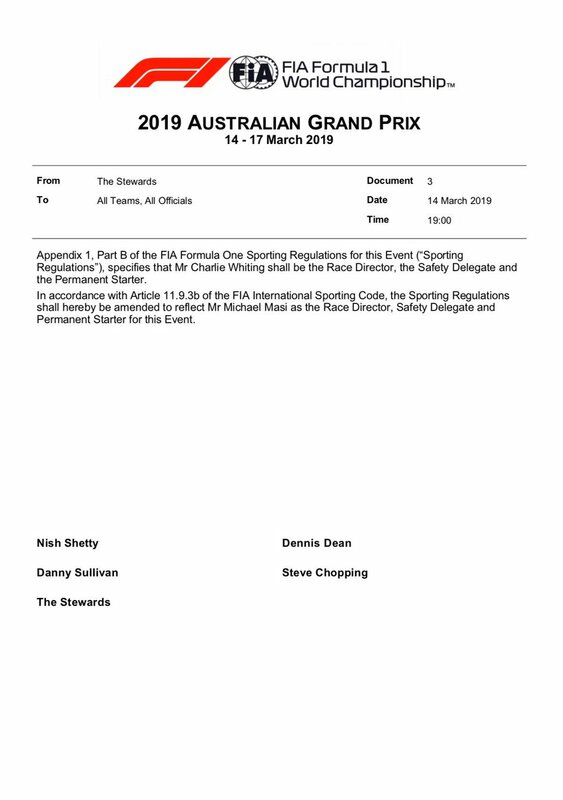 New Race Director Michael Masi. I'm stunned at this sad news. RIP Charlie. F! will never be quite the same. What tragic news. Just yesterday he was talking to the drivers and was perfectly healthy and today he is gone. Just shows you how sudden death can be. I can't imagine how his family must be feeling especially with it happening when he is all the way out in Australia. HAAS paying tribute to this weekends Melbourne race. so shocking and sad news. RIP Charlie. consolation to his family in what must be a very difficult time for them. 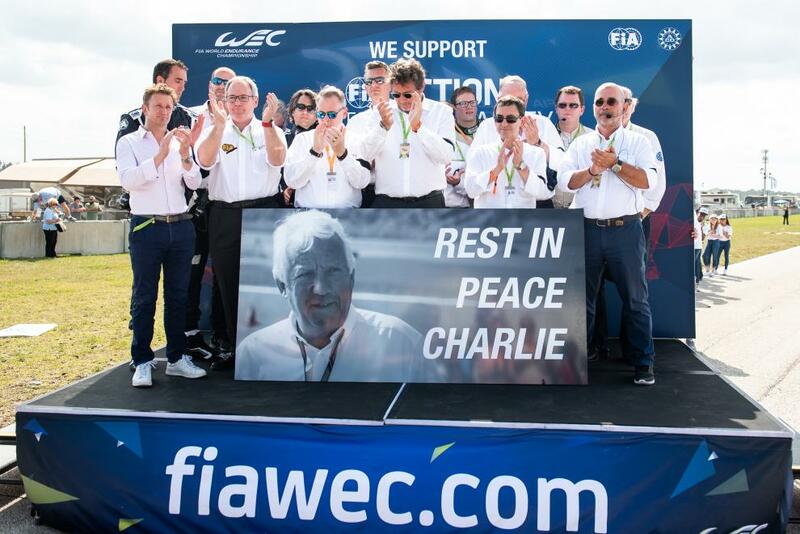 RIP Charlie Whiting, you will be missed! Thanks for everything, Charlie. Rest in peace. Shocking news indeed, gone too soon. Hero's come and go, but legends never die! Sad news, bad way to start the season. Shocking when it is preventable. My dad when flying had to wear constrictive leg bands to stop such occurance. Pity he never had a check up that highlighted it as a risk.